There are currently 29,571 users on this website. OBV? crowned coat of arms with hammer, pincers, legend MONET(a) INE VE?BUM D? REV? 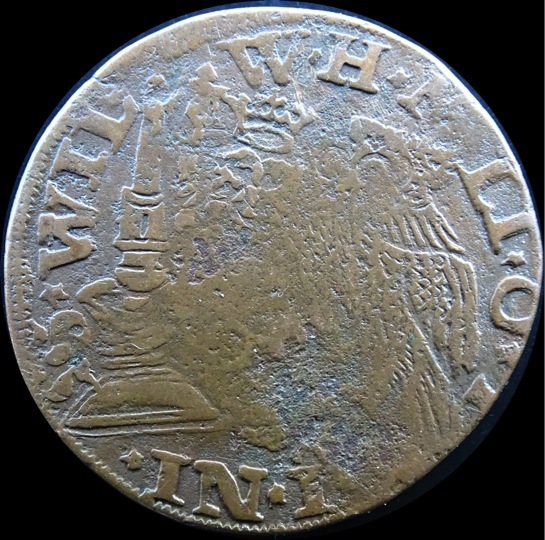 crowned double eagle, wilhelm II ? Huh. Those look like blacksmith tools on the shield. One of those emergency issues? Austrian states perhaps? thanks for helpful comments ! yes indeed - blacksmiths or perhaps the guild of coinmakers? a St. Elois coin? 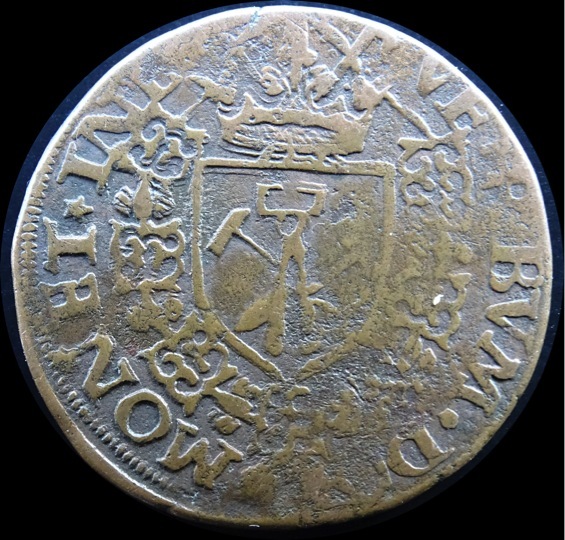 Need the size, weight and any date you may be able to see in hand, a quick look through the lower German/Austrian states yielded nothing close, a crowned eagle, may be further south in Europe. But I do think it is a private or emergency issue (seige) currency. Even the Dutch area? With Latin, it would be within the Holy Roman Empire, up to 1806. The description of the reverse looks interesting. Found this too which may be why it's so obscure? how great to receive feedback! The first side might be "VERBVM DOMI MONET IN ETERNV"
So interesting how we all look at the same image and draw different conclusions. I looked at that area on the rev and thought that it was a plumed helmet from a suit of armor. 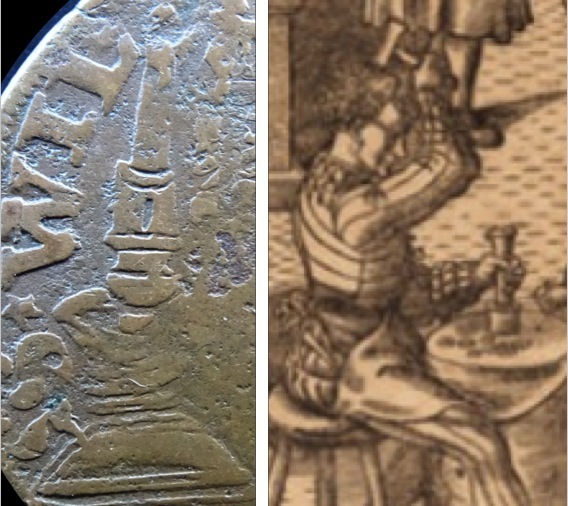 Does the reverse left represent a pair of dies used for hand-hammered coins.? What a neat possibility. Certainly could be. it was the early motto of the Lutheran Reformation, appeared for the first time in the court of Frederick the Wise in 1522 as can be seen on the medaillentaler below. The theory of the image being of a set of dies with a blank or flan inserted fascinates me for some reason. I've been trying to find an image of a surviving die set that resembles the image with no luck. I did find this passage describing the different types that I think covers what we're looking at. "In striking a coin two dies, an obverse and a reverse, were usually employed. The obverse or lower die would have been set into an anvil, often a block of wood. The upper, reverse die was loose, and could take a variety of different forms. 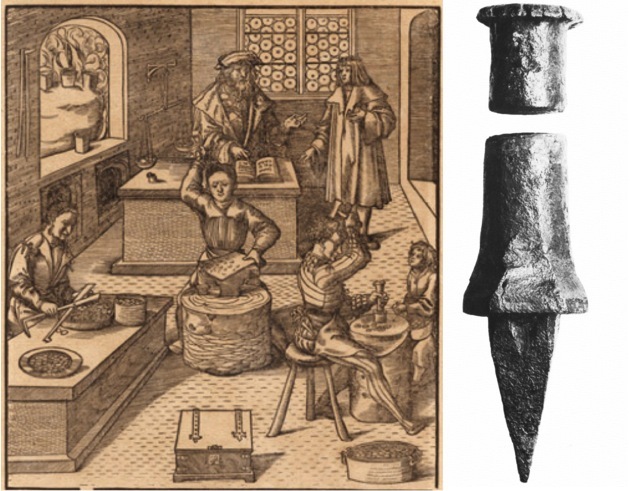 The type could be cut directly into the end of a short rod, cylinder, or pyramidal piece of metal, but most often the die proper was simply a short segment or disk of bronze inserted into a punch or collar made of iron. The whole punch, with the reverse die attached, was probably only about two to three inches long." interesting read chafemasterj, thanks ! Oh wow. I hadn't noticed that. Good eye. I suppose if you were minting coins illegally you may as well go full out and poke fun at the Crown while you're at it. Edit: Perhaps the hammer die or die holder that we see on the coin is what they looked like prior to being mushroomed over by use. Edit number 2: I finally see all the parts of a crowned eagle. My mind wouldn't put all the pieces there together before.